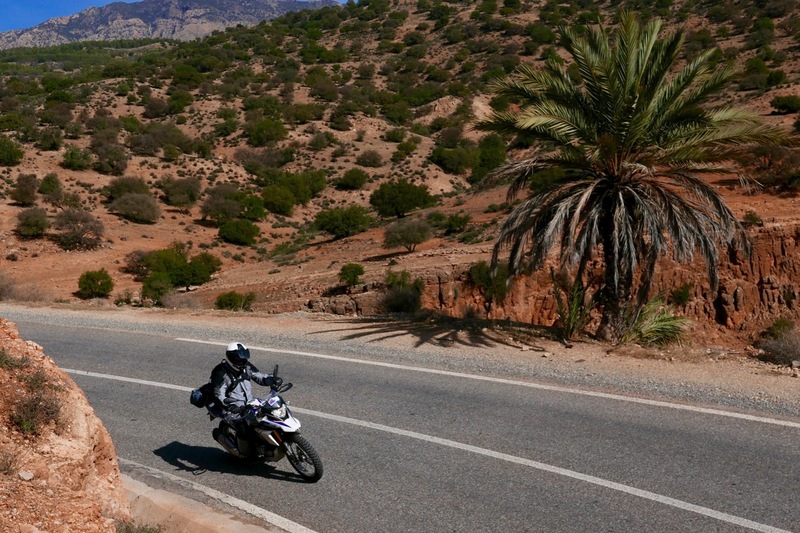 In April 2018 a couple of us tested two brand new but modified rental G310GSs in the High Atlas, alongside one of the aged XR250 Tornados they were replacing. A few months later I’ve now had a chance to ride for a month with- and on more rental GS310s, effectively covering 11,000 rider kilometres, with me accounting for 2200km. Here’s what we found. Enough poke and agility to be a fun canyon bike and, all things considered, satisfactory on the dirt,. • Hallelujah, a near-proper toolkit! Now with 10,000km on the clock, give or take, the bikes I used on my tours had loosened up noticeably since the new 310s we tried in April. Selecting neutral is still difficult from a standstill, but at higher or lower revs, they pulled better and felt less harsh. The first 310 I used was a spoked conversion with a brand new Metz Karoo on the front and a worn E-07 on the back. Once the Karoo’s unnerving edginess quickly wore down, or the Moroccan backroads we ride, this (or similar) is a much better tyre combination than the stock Anakee road tyres. 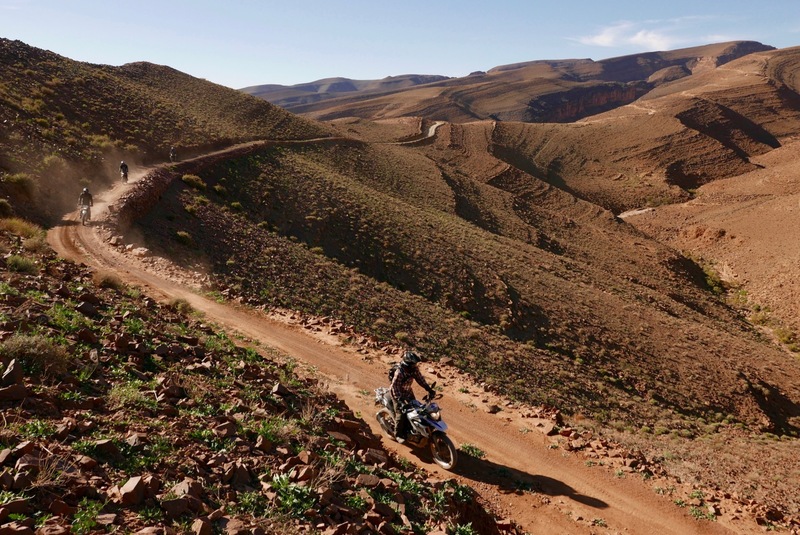 No surprise there: on your typical gravel-strewn, bendy Moroccan mountain road, the Michelin rolls sideways over gravel patches, where the widely blocked Karoo or 07 find grip sooner. 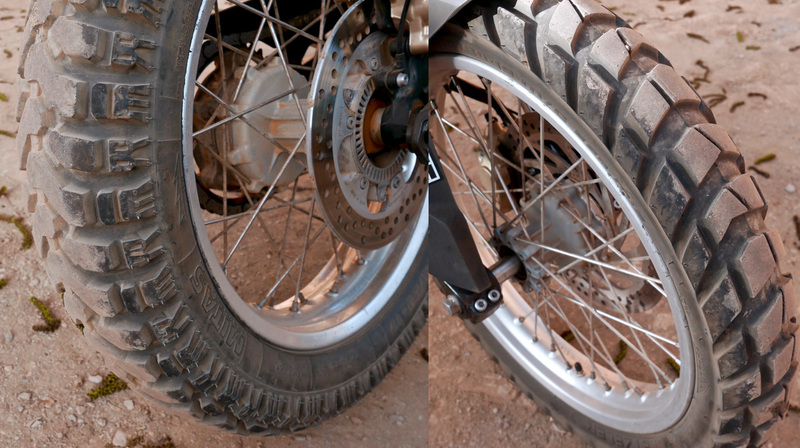 And once aired down to 2 bar (28psi), on full dirt the blocked tyres obviously provided more reassurance. This time on both 310s I used I bothered to jack up the rear shock at the end of day one. The job’s easily done with the under-seat toolkit: pull off the LHS side panel with a 5mm hex key and with the C-spanner I cranked up the shock to max or one below. With my 100kg-in-kit and 10-kilo load the bike rode much better over lumpier highway bends and on the dirt – occasionally bottoming out where you’d expect it to. You can’t adjust the forks but, like the F700GS I also rode for a week, for a budget bike BMWs stock set up was much better than many Jap bikes I’ve owned. This time round I meddled with the dash too. Besides rpm, gear position, fuel level and time of day, you can scroll through read-outs for: odo, 2 trips, engine temperature, date, current and average kpl and remaining range. The only one I miss there is ambient temp, but I didn’t have difficulty reading it as I did in April. It was the way with many of the GS’s small irritations we registered back then: after a while you just get used to them. A good example was the wide 11-litre tank – or tank casing (left) which helps bulk up the 310’s look. Many riders found it annoying when trying to stand up and get their weight forward, and (depending on your footwear) the narrow footrests don’t help. Or so I thought, but after a couple of days I didn’t notice or just gave up standing up as the bars were a bit too low and anyway, I’m a bit lazy. A couple of riders could have used the 15mm lower saddle option and others, like me, could have done with bar risers. Comfort wise, the secret with all duff saddles is get off every hour, which I Morocco we end up doing. Failing that, standing up into the 90-kph breeze is all you can do. The screen too looks ineffective, it’s just a layer of the front cowling but it works as an air lip, jetting air up without the in-your-face plastic which, BMW say, newbie riders don”t like. I used mine to lash down waterproofs and can’t say I noticed the wind blast, but I rarely exceeded 90kph (55mph). In the rain of course, no air-dam effect will keep it off you. 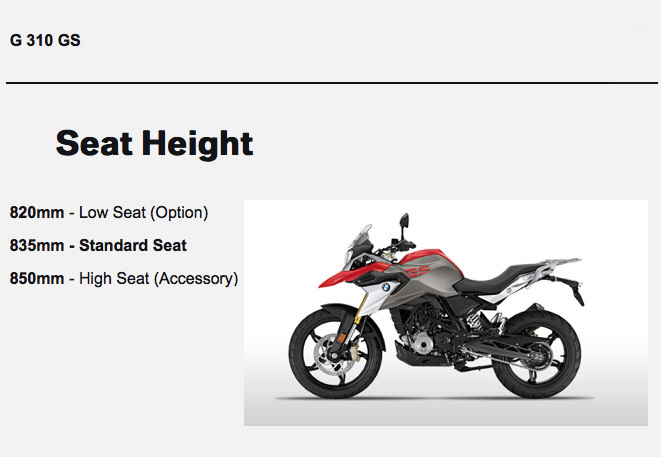 I’m sure the usual aftermarket suspects have released full height options. One thing that really needs changing is the tall gearing. The rental agency told me it runs a 19T on the front – unusually large. Most others say stock is 16T and that a 15T works much better. As it is, a 310GS is over-geared and won’t pull to the red line in top. I briefly clocked 140kph with a few hundred rpm left (claimed top speed is 144kph/89mph). So dropping a tooth may allow it to rev out at the top end while making the GS hopefully less stall prone and more manageable at low speeds. Many times riders would stall and stall pulling away from cold. It could be unfamiliarity with the low-down gutlessness not helped by the short range of clutch movement, but lower gearing would surely help. Almost every time I recorded it, I got the best fuel consumption of the group,probably helped by the fact that I’m paying for the fuel, knew the roads and wasn’t on holiday. The highest is got was 93mpg with others on 310s mostly in the mid-80s and as low as 78mpg. BMW claim an average of 85 (3.33k/100L) which seems spot on. 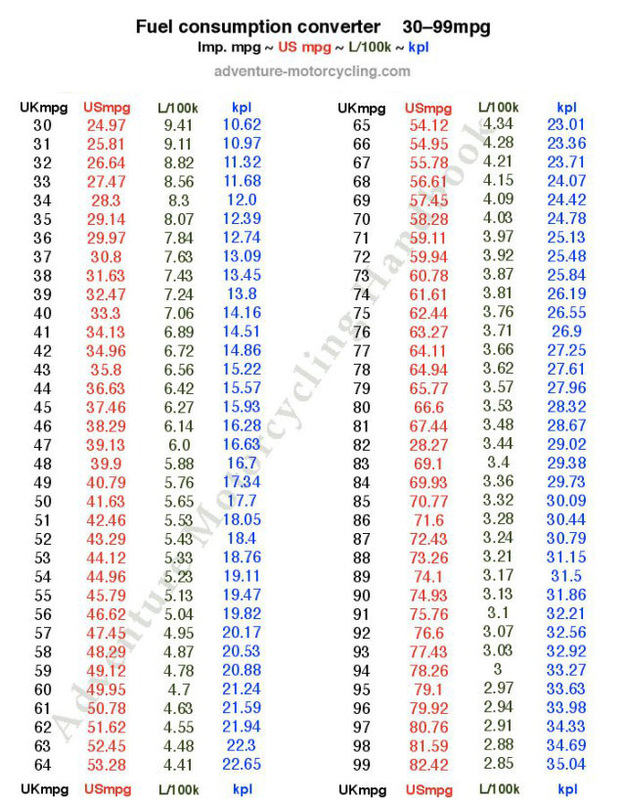 So our figures give a range of between 300km and 360km from the 11-litre tank (conversion table, right). The fuel light comes on with a good two litres left. This fuel consumption was better than the aged Tornados being replaced. On one circuit an R1200GSLC ridden at our moderate, sub 100-kph pace got no better than 66mpg, so this may be just about the best possible mpg from this powerful machine, which is well over 400km range. • A couple of the bikes with the wire wheel conversion had malfunctioning ABS: the ABS ring sensor was probably slightly mispositioned. • One one wet morning and on a couple of chilly <5°C mornings, a couple of the bikes wouldn’t start straight away. One guy ending up jump starting, needing to get into 4th gear. To be precise, if you didn’t get the engine to fire up first time, it took a minute or three to catch, initially misfiring before firing properly. Switching off to possibly reset something, and ‘no throttle’ seemed to do the trick. • A couple of times my engine coughed once under light load. Never had that on an efi bike. 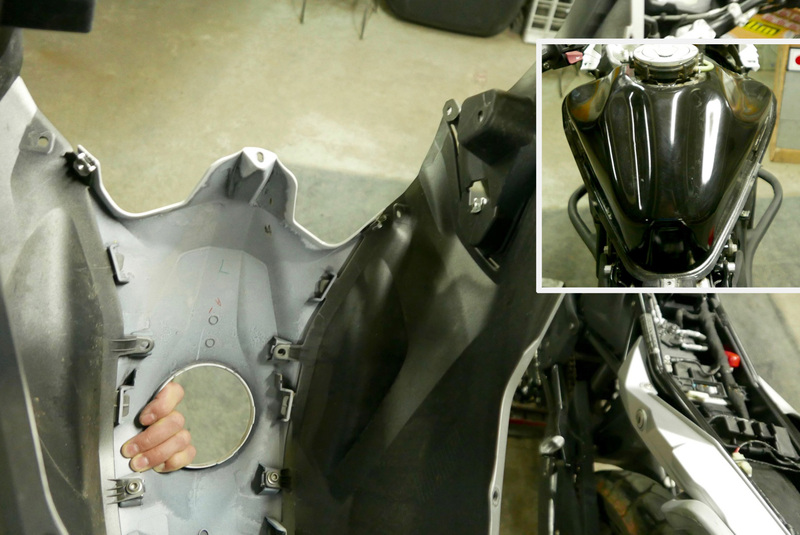 The agency has reported no issues with breaking sidestand mounts and we didn’t notice worn cush-drive rubbers. Perhaps because it’s trying to disingenuously capitalise on the reputation of the bigger GSs by brand association alone, the 310GS isn’t a bike riders warm to. The buzzy engine lacks grunt and like any machine tbis size, needs to be wrung out to get a move on. On my previous tours riders often came back looking for something like the 250 Tornado, they’d just ridden (often ending up with a CRF), but none of the mature riders expressed the same interest in adding a BMW’s mini GS to their fleets, far less a sole bike. 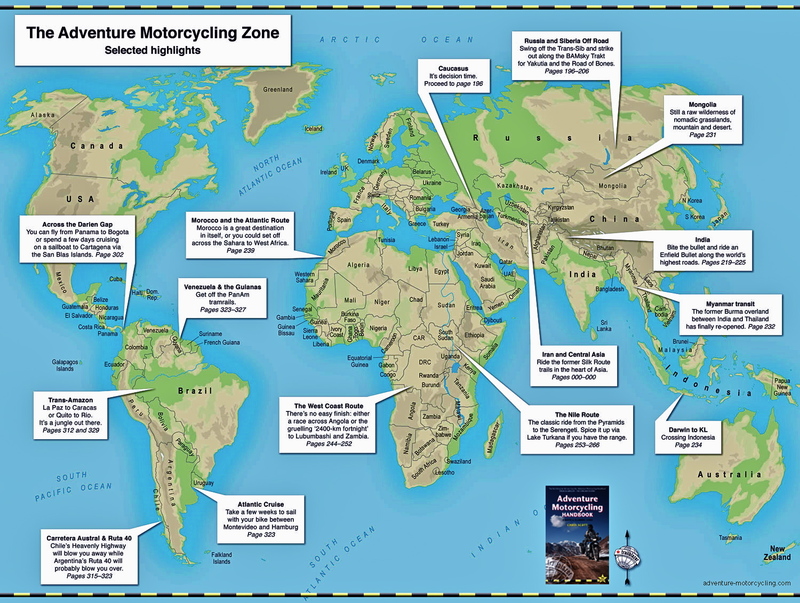 Try one out on a flat open road and – like any road bike of this capacity – you’ll be underwhelmed unless you’ve only ever ridden smaller machines. 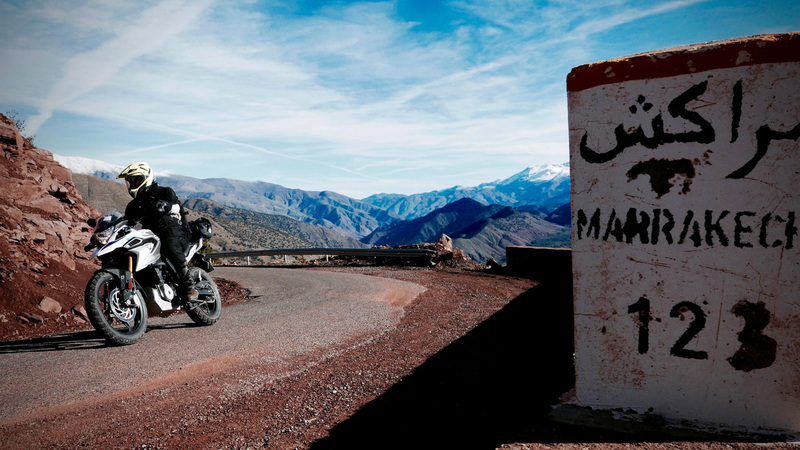 But on the 1100 clicks we cover over a week, its no exaggeration to say we swing through thousands of bends, and up in the mountains, through the canyons and over High Atlas passes, the 310GS is all the bike you need. It’s not fast enough to get you in trouble, it’s not heavy enough to get out of shape, and it has enough braking, grip and chassis stability to keep you on the right side of the Armco. 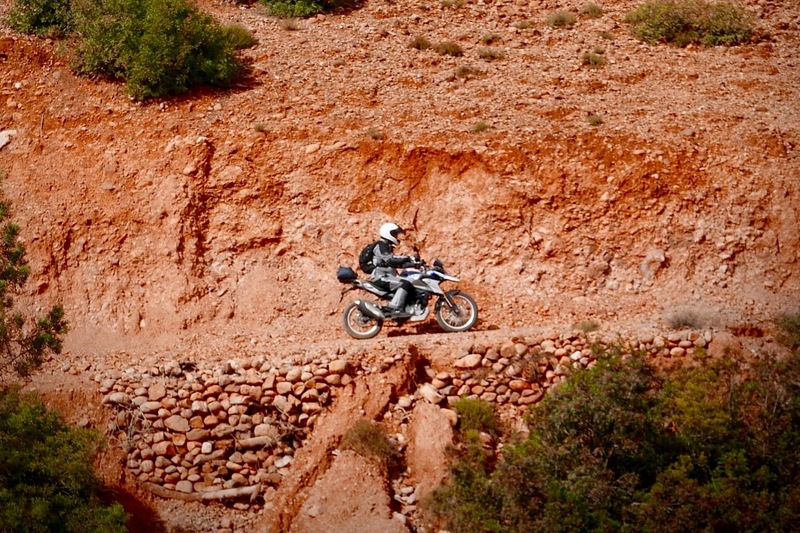 On the trail the stock tyres will hold you back, as does the weight and modest suspension travel. 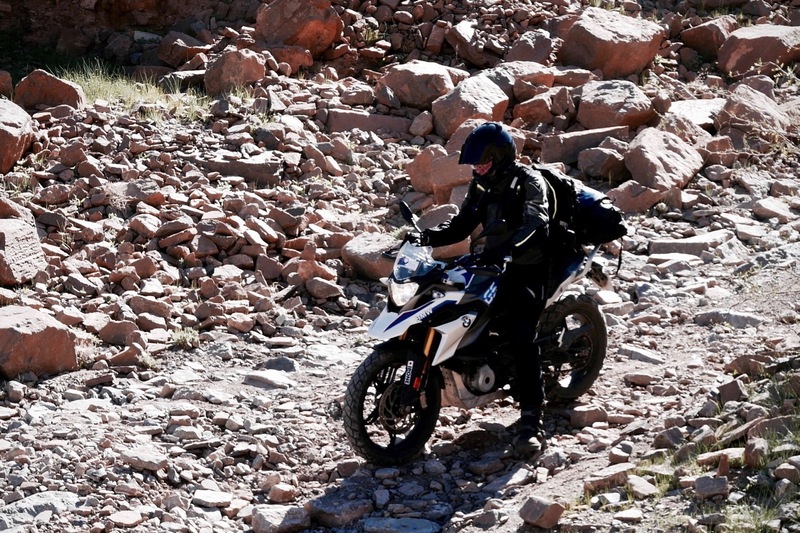 But ridden within these limits and your own ability the GS manages fine on gravel tracks and briefly rough sections, while still being a fun backroad bike. Asking round the dinner table on the last night, we all agreed the G310GS scored a solid 7/10. 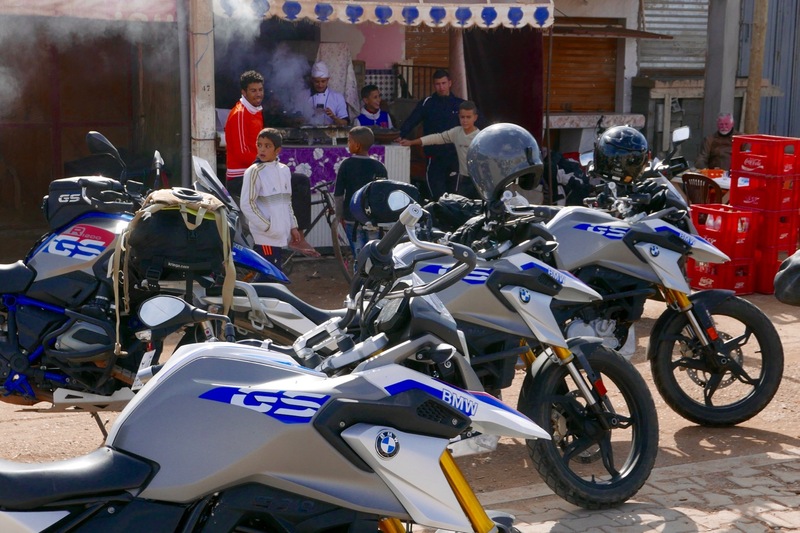 This entry was posted in AMH News, BMW G310GS. Bookmark the permalink. 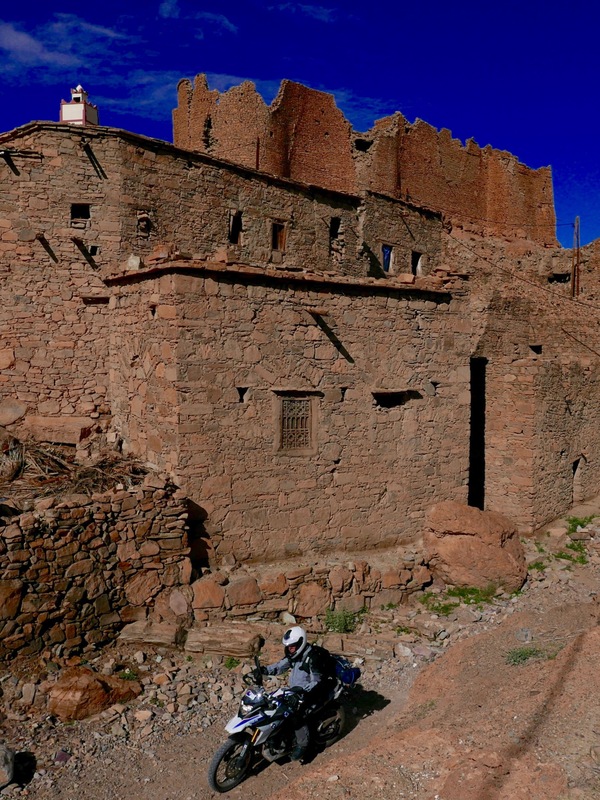 Is it possible to rent g310 in Morocco or do I need to buy a organised tour? Easy to rent if you have a full moto licence. 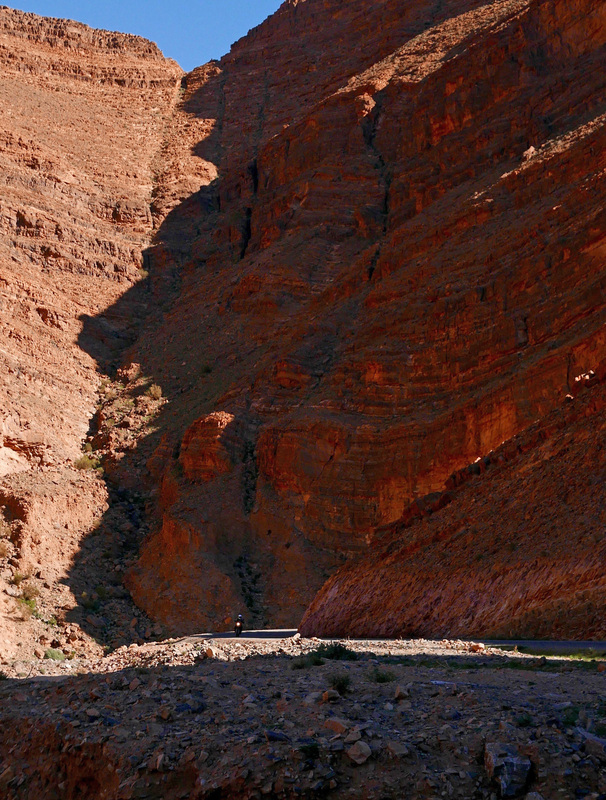 See http://www.loc2roues.com/fr/parc/Motos/2 in Marrakech. Other rental places may also do the 310.